Revive your inner pilgrim and master the art of colonial cooking with sixty recipes celebrating America's earliest days! From their voyage on the Mayflower to the days of the American Revolution, early American settlers struggled to survive in the New World. Join us as we travel through time and discover how our forefathers fed their families and grew a nation, from eating nuts and berries to preparing fantastic feasts of seafood and venison, and learn how you can cook like them, too! The First Thanksgiving, 1621: "Venison over Wild Rice Cakes" and "Pumpkin Pudding with Rum Sauce"
Alexander Hamilton's "Beef Stew with Apple Brandy" and Abraham Lincoln's "Chicken Fricasee"
Rhode Island's "Bacon-Kissed Clam Cakes" and Massachusett's "Chowdahhhhh"
Forefather's Day, 1749: "Sufferin' Succcotash with Buttered Lobster"
Jim Beam's "Bourbon Oatmeal Raisin Cookies"
Including a "Tipsy Timeline" of New World alcoholic beverages, the menus of the oldest taverns in America, and other bite-sized tidbits to satiate your curiosity and hunger, A Thyme to Discover revives forgotten culinary traditions and keeps them alive, on your own dinner table. Tricia Cohen grew up surrounded by family, food, and love. She is a hostess, gourmet home cook, and sous chef. She coauthored A Thyme and Place and A Thyme to Discover, two books in a three-part historical cookbook series. She lives in Pittsburgh, Pennsylvania. "If you love to cook and love American history, this book is the best of both. The latest from the kitchens of Graves and Cohen combines one part history with one part beautiful illustrations and a bucketful of mouth-watering recipes for a book that will inspire you to get out your apron—and fast. It's fun, factual and fantastic!" 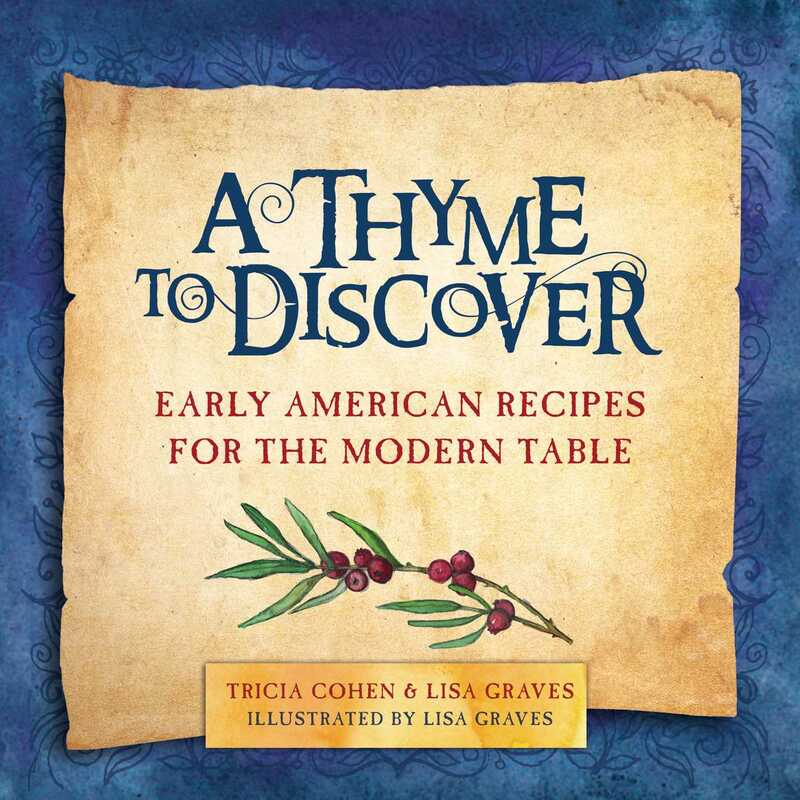 "A Thyme to Discover makes culinary fantasy out of returning to early America and the pilgrim days. The recipes go deep into the fancy ingredients of the time—seafood and venison—but reimagines them for today's palate. We're special fans of the recipe for Warm Mulled Wine Apple Cider Sangria, perfect for a cold day." "This fun, informative, appealing book makes a great gift for foodies and history buffs alike." "Team Thyme have done it again! Cohen and Graves’ new book, A Thyme to Discover, is a wonderful melding of inspired recipes, stories. Tricia Cohen created a set of dishes that recreate the Early American culinary experience without having to be a battlefield re-enactor. Lisa Graves’ illustrations teleport you to those earlier days as soon as you bite into 'Yankee Red Flannel Hash with Braised Cabbage' or let 'Cranberry and Orange Honey Butter' roll off your taste buds. All this and 'Chowdahhh!'" "I don't think I have ever been as captivated by a cookbook as I was by this one. From its clever title to its charming illustrations, wonderful recipes, interesting history, and snippets of facts peppered throughout, A Thyme to Discover has a little bit of everything. . . . Children will enjoy the whimsical illustrations, adults with no interest in cooking will find the history fascinating, and the cook, well, the cook is just going to fall in love. . . . A book for foodies, history buffs, and red-blooded Americans in general." "Tricia and Lisa have created edible history lessons of sorts, allowing readers to re-experience the what it was like for the first Americans to sit down for dinner."